HUNTINGTON, W.Va. - Damier Pitts led the Thundering Herd with 25 points as it grabbed a dominating 83-69 victory over UCF at the Cam Henderson Center on Saturday evening. Pitts hit 7-of-11 shots while going 10-11 from the free throw line. Johnny Thomas scored 14 points for Marshall (21-10, 9-7 C-USA) while senior Tirrell Baines, playing his final regular season game, chipped in 11. Leading the way for UCF (19-10, 6-10 C-USA) was Marcus Jordan, who led all scorers with 27 points. Keith Clanton was the other double-digit scorer for the Knights, finishing with 17. "It was a great way to cap off our regular season. Our fans were tremendous and obviously it is safe to say they were electric. They were reviving and tremendous," head coach Tom Herrion said. "I thought our kids played very well. They were very efficient. Offensively we were good, if we continue to rebound like we are, it allows us to be very productive." DeAndre Kane knocked down a three in the first minute to begin the scoring before UCF notched four in a row to take a 4-3 advantage. A jumper by Baines with 16:53 left in the first half gave MU a 5-4 lead and would mark the final lead change of the contest. With the Herd up 7-5, it would embark on an 8-2 run to open up a 15-7 lead. That edge would reach double figures for the first time when Dago Pena connected from downtown to give the Herd a 33-21 lead with 3:32 left in the period. The MU advantage would grow to 16 with 40 seconds left as Marshall took a 43-27 lead into the locker room. The sellout crowd of 9,036 fans got even louder to open the second half as Thomas recorded three dunks and Kane hit a trey in the first three minutes as MU opened up a 23-point advantage, 53-30. A Pitts jumper with 13:54 left in the game gave Marshall its largest lead of the game, 61-37. UCF did not give up, cutting the lead in half thanks to a 14-2 run. The Knights hucked it from three-point land, hitting four over the span of just 2:24. A.J. Rompza hit a pair of threes in the run. 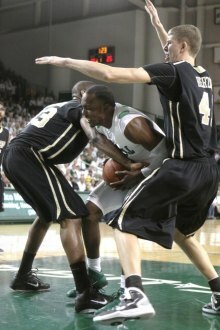 Marshall would regain its edge, leading by as many as 20 in the final minutes before taking home the 14-point victory. The Herd was once again dominant on the boards, outrebounding the Knights by a margin of 42-25. Marshall also outshot UCF, 51.9%-44.4%. Free throw shooting was also a strong point for MU, who connected on 22 out of 27 attempts from the charity stripe. On Wednesday, Marshall will begin the 2011 Conference USA Tournament, which will be held in El Paso, Texas at the Don Haskins Center. HerdZone.com will have an update as to the time and first round opponent.